Obituary for Winona Green Sowers | C & S Fredlock Funeral Home, P.A. Winona Muriel (Green) Sowers, a native of Sulphur, Elk Garden,West Virginia, was born August 2nd, 1919. She was the daughter of the late S. Cassel and Bird (Wiseman) Green. Winona died on Saturday, February 9, 2019 in Tampa, Florida at the age of 99. Mrs. Sowers was a graduate of Elk Garden High School and Shepherd College. 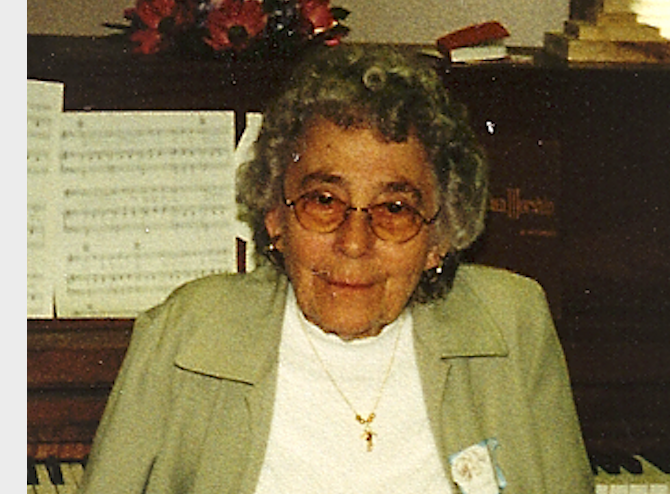 She was a Mineral County schoolteacher from 1938-1985, one of the longest-serving teachers ever in Mineral County. She taught at Gleason, Ridgeley, Emoryville, Beryl, and Elk Garden schools. Her specialty was music. She taught thousands of children. In some cases, she taught three generations of the same family. School and music were her passions. Mrs. Sowers was a member of Sulphur United Methodist Church, United Methodist Women, Alkire Chapter #10 Order Of The Eastern Star, and West Virginia Association of Retired School Employees. Surviving are one son, Lloyd Ross Sowers, daughter-in-law, Kim Canavan Sowers, two grandchildren, Jack and Gray Sowers, of Tampa, Florida, a brother, Lloyd Lantz Green, and a nephew, Lloyd Richard Green, both of Bloomington, Maryland. In addition to her parents, she was preceded in death by her husband, Ross Dale Sowers on September 6, 1988. After her retirement, Winona resided for many years in Lehigh Acres, Florida. In recent years, she lived at Angels Senior Living in Tampa, near her son Lloyd, and his family. Friends will be received at the Nethken Hill United Methodist Church on Friday, February 15, 2019 from 10 AM-12 PM at which time a funeral service will be held with the Rev. Matthew Paugh officiating. Interment will follow in the Nethken Hill I.O.O.F. Cemetery. Arrangements have been entrusted to the C & S Fredlock Funeral Home, P.A., Kitzmiller, Maryland.